I first noticed them early in 2011. Websites such as Byliner and The Atavist and news outlets like the Washington Post were putting out ebooks that were either timely or had a length that didn’t fit the usual print formats. It was catching on. Jon Krakauer wrote one for Byliner and readers reportedly downloaded 70,000 free copies in the first 72 hours. Soon Amazon picked it up for their Kindle Singles program, priced it at $2.99, and it became a bestseller. I had an idea for a Kindle Single but had less ambitious goals. I hoped to build on the story in my novel The Losing Role, a historical espionage thriller based on an actual German secret mission to infiltrate the US front lines during WWII’s Battle of the Bulge using English-speaking agents disguised as American soldiers — a desperate and doomed ploy that did not end well. I could tell the true story of this mission that I dramatize in the novel. The topic didn’t require a whole book but deserved more than a 5,000 word article. I pitched it to the Kindle Singles team in an email and forgot about it, as any writer who’s been around the block tries to do. To my astonishment, Amazon editor David Blum contacted me about the possibility of doing a Kindle Single. I felt honored and challenged, and lucky for once, since many Kindle Singles are curated from established sources or written by known names. Fast forward a few months. 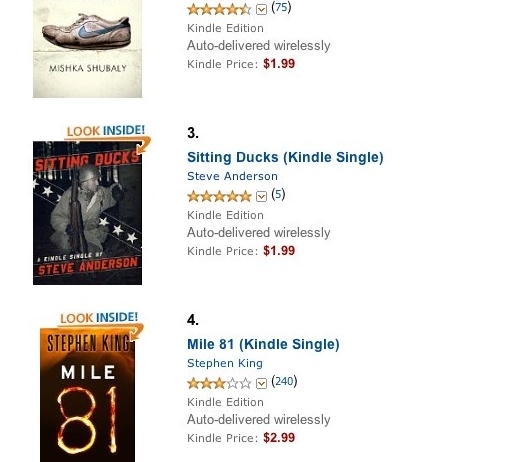 After a rewarding experience working with Mr. Blum and his team, my Kindle Single Sitting Ducks debuted the last week of December, 2011. In a couple weeks it had reached number #3 on the Kindle Singles bestseller list and cracked the top 100 for the entire Kindle ebooks store. As of this writing, it still hangs on in the Kindles Single lower top ten, is a respectable #408 in the overall Kindle store, and holds steady at #2 in the Kindle stores for German history and World War II as well as #4 for all books (print and ebook) involving German history. If you know me, you’d know I’m not bragging. I prefer not to talk about sales. Rather, this whole thing still blows my mind. It’s a quick lesson in how, under right circumstances such as front-and-center placement on Amazon, an unknown writer can reach the right readers quickly and most directly. The best part is, some of those readers are giving The Losing Role a shot. You get the picture. A writer is always in trouble when having to resort to a word count. This is no one’s fault. Things are simply moving too quickly for clear designation. Recent articles (among many) such as this one from the New Yorker and another from Canada’s Quill and Quire do a fine job explaining the format. Yet readers who buy stories like Sitting Ducks aren’t always clear what they’re getting even though the format is explained on the product page. One reader gave me a poor review partially because my book was short, something that happens often. Again, no one's fault. Who has time to know? Every day (and news cycle) a solid article like this from Slate, piggybacking off the New York Times, attempts to predict the latest game-changing moments that are already passing. But the real action is often in the comments. Meanwhile, the Author’s Guild just came out (as in minutes ago) with a piece titled “Publishing’s Ecosystem on the Brink.” It will probably spark a good conversation in the comments section. But I don’t know, because I haven’t had a chance to read it. For the short ebook, it would help if we had a distinct name that lets us avoid the explanatory conversation. Amazon calls them Kindle Singles, and Apple calls them Quick Reads, but these are branded names. Others call them longreads (from the first-rate online article site), longform (a similarly great site) or short books, but these don’t seem to have stuck yet. These are terrible. Crap. Which the format doesn’t deserve. Which brings me back to the length. In the traditional world of publishing, I would have had to pursue (through an agent, certainly) a publisher willing to put out a whole book on the Germans’ wild secret mission. That would have meant padding the story with background and tangents the story simply didn’t need, especially if it was to be readable. We’ve all read nonfiction books that clearly do this, and it’s a chore for the reader and certainly the writer fulfilling his book contract. Traditional print formats demanded a prescribed length for topics. Not any more. The new format opens so many possibilities for readers and writers. I’m seeing creative nonfiction pushed to the limit using the craft of fiction and essay, much more like an excellent documentary than a textbook or a tome. And no matter what one thinks of Amazon, they’re doing great things for writers right now. It might not be their goal, and they may squash us tomorrow. But for now, I’ll take it. Like the ebook, the new format is here to stay and will exist alongside the print book. I can’t wait to get going on writing the next one, and not because I know a publisher will buy it and print it, but rather because I simply know there are people out there who’ll read it no matter what you call it.